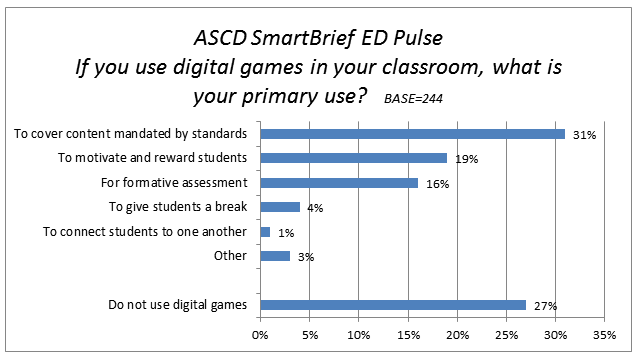 Several recent articles about the use of gaming in the classroom indicate that their use has been increasing. One study, released by the Joan Ganz Cooney Center, indicated that more teachers have introduced gaming and are using games more frequently. Some of these games are traditional board games, but others are using digital games. This study found that one of the preferred uses of games is to encourage and reward students, in particular, lower performing students. This survey question was included in ASCD SmartBrief, a free daily e-mail news service that provides summaries and links to major education stories and issues, which has more than 200,000 subscribers. Using ED Pulse, the weekly online poll, data was collected from 244 readers, starting on June 12, 2014. Online surveys do not provide a random sample, as participants are self-selected, meaning that a margin of sampling error cannot be calculated or quoted. In addition, the population and sample are limited to those with access to computers and an online network. However, online surveys have been shown to produce results that have proven to be reliable predictors of outcomes, including election results. If you have a question on education that you would like to see addressed in a future ED Pulse poll, feel free to submit it in the comment section below, along with any other comments. Kit Harris is the marketing research lead at ASCD. The quantitative and qualitative research work done is in support of strategic initiatives in marketing, membership, product/program/service development, and conferences/meetings. Harris started her career in Chicago at a marketing research firm, then moved to D.C. to serve as the research director at advertising agency Earle Palmer Brown & Associates. Prior to coming to ASCD, she ran her own research firm.